This business card holder has a carbon fiber design known for being lightweight, durable and resilient yet maintaining an eye-catching design. 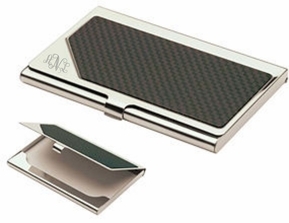 The card holder has a high polished silver casing that works well with the matte black carbon fiber. The card case has an area in the bottom left corner that can be engraved with a name or initials. The backside has a silver polished finish throughout that can be personalized with additional engraving. This business card case is one of our slimmest most compact models but can still hold up to 15 cards.